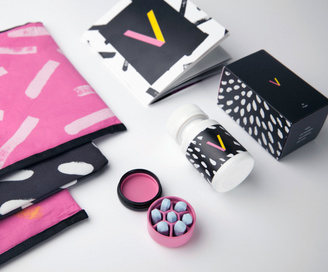 To navigate the stigma of being seen with something that looks medical, or which may be seen to advocate for promiscuity, we’ve created a starter kit that empowers women (and gets them excited,) while also being delightfully discreet. One of the barriers to both uptake of and adherence to PrEP is the support or opposition experienced from the sexual partner. Some women were fearful of their sexual partners finding out they were using PrEP, while others were empowered enough not to care. We have designed a starter kit that addresses both—by making it look like makeup or a fashion brand, women were given the choice to share the usage with others, as men didn’t look twice, and it acts as a good conversation starter between women. Upon first use of the starter kit, the goal is to provide the woman with all the materials necessary in order to use oral PrEP and feel confident while doing it. If she doesn’t understand how to use the product from the beginning, she won’t be motivated to start using it right away or adhere in the long term. Once she’s used it for the first time, she needs to figure out how to make it part of her daily routine. This includes how she should remember to use it, where and how she should store it, and how she deals with men, kids and parents who might ask questions if they encounter the product. Note that the starter kit is just that―something to help a woman get started. As such, it only needs to be provided with the first prescription. If it’s possible, have extra bottle stickers to provide with refills, since those aren’t reusable, and it can help women continue to be discreet with their regimen. 1. With men, the best approach is to say nothing. Or to reveal everything. 2. A female product is more discreet by being boldly graphic. This element of V was an overwhelming success with all the research participants in South Africa. All items for the starter kit are neatly stored in this useful and reversible bag with a zipper that looks like it’s for makeup. To avoid the bag becoming recognizable, we recommend multiple colors and patterns, and potentially selling them in-store (separate from the pill) to further mask that they’re for PrEP users. If it’s handed out in public clinics, make sure that it comes in a brown paper bag so that the makeup bag does not become associated with clinics. Allowing women to be able to hide their use of PrEP while in a public setting decreases barriers to use and, by piggybacking on a current daily ritual (like putting on your makeup), it provides a visual reminder for daily, consistent use. 1. A woman’s handbag is generally off-limits or intentionally ignored by men. 2. For a woman, it’s not about being discreet, but about being in control. 3. If it’s medical, you’re sick. As the oral dosage of PrEP has already passed regulatory approval with a pill bottle in many countries, a simple sticker can be used to hide the fact that it’s medication and the bottle can be placed in a box that looks more like makeup than medication. Not only does this help avoid the fear of being perceived as being sick, but gets women excited to use the product. We’ve designed these elements to work with both Mylan and Gilead pill bottles. 1. If it’s medical, you’re sick (even if it’s preventative). As oral PrEP comes in a medical pill bottle, we have designed a unique carrying case with seven slots for seven pills—one for each day of the week. This helps women keep track of their daily dose and is more convenient to transport than a larger bottle. The rubberized interior eliminates the telltale rattling sound of pills in a bottle, a commonly-reported barrier to usage, and it looks like lip balm, which further disguises its use. As with the packaging, we’ve designed this to fit pills from both major manufacturers (Gilead and Mylan). 1. The sound of rattling pills is a red flag worth avoiding. 2. If it's medical, you're sick. This provides women with the basic information they need to know in order to ensure they are using PrEP correctly and safely. It also includes advice on how to discuss their PrEP usage with partners and family, if they choose to do so, as well as tips for adherence. 1. With a complex marketplace and a literal audience, it’s important to be explicitly clear. 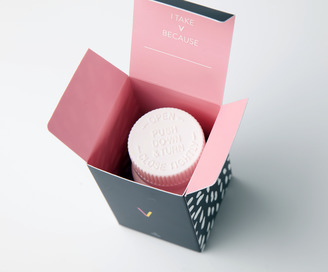 Extra V stickers are included so that a woman can stick it on something that she will see everyday as a reminder to take her pill (for example, on a bathroom mirror/back of a cell phone) or to cover the medical label of the pill bottle if she’s worried about someone finding it in her home or bag. These were also popular as inexpensive swag just to decorate phones and notebooks, since they look cool! This is included in the kit so that the date for the refill can be documented. Also, it signals a sense of belonging with other women who are also using PrEP. In an advanced operation, the loyalty card could function just like one you get from a store, where it tracks refills on the medication and you can earn rewards over time. In a simpler operation, you could ask a local store or salon if they would consider giving a discount to woman that have the card. Check out the Adherence section to learn more about setting up an incentive program for refills. Below you will find the key activities required to implement V. Under the V lite section, we’ve described hacks or adaptations for the more budget-conscious. 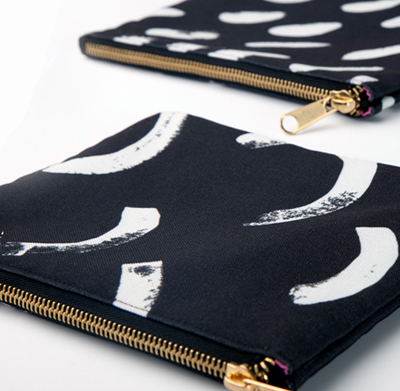 Either purchase makeup bags or produce the pill carrying case. Ideally there is a central entity that is producing starter kits for a region (see the Implementation Recommendations), so all you have to do it order and distribute them. If you are that entity, or you want to make the kits yourself, here is how. Talk to potential partners to leverage their manufacturing and logistics contacts and capabilities where possible. Check out the Implementation Recommendation section for costs and potential suppliers for producing each element of the kit. Produce Bags: Work with a local cut & sew shop or garment maker to produce the bags. They should be able to help you source the fabrics. Print: Work with a local print production shop to produce the Starter Guide FAQ insert of the kit and, if possible, the secondary packaging (i.e. the box for the pill bottle) as well. If local print capabilities are limited, order the boxes online from a vendor like http://theboxco.co.za/. Order custom stickers online. from vendors like https://www.sheetlabels.com/. Order extra bottle stickers to include with refills. Produce Pill Case: Find a medically-compliant local contract manufacturing shop that can produce the pill case from the design files and specifications provided. Since the hard exterior of the case can be purchased in bulk online, they will need the ability to do precision molding (to make the pink insert) and hot-pad printing (to print the graphic pattern on the hard case). Know that scale dramatically affects cost, since the majority of the expense is to set up the custom tooling. This means that making 5000 will have a much cheaper unit cost than making 100. Order loyalty cards: Buy them in bulk online from vendors such as https://cardsplus.co.za/ or http://www.easyloyalty.co.za/, depending on how much functionality you want. Assemble: You can put together the kits yourself before sending them to clinics or pharmacies, or train people at the point of distribution to assemble them. If you are producing large volumes, you should consider working with a logistics company with value added services to provide warehousing, kit assembly services and potential distribution services for the Starter Kits. One local example is DSV global transport and logistics, whose Corporate Social Responsibility (CSR) department supports projects connected to the fight against HIV (and therefore may consider providing free or discounted services). Distribute: Set up the appropriate channels for clinics and pharmacies to order and receive the kits. This could be as simple as regularly visiting clinics and pharmacies to deliver kits yourself, or as complicated as setting up an online order form and working with a third party logistics company like the one mentioned above to warehouse and deliver the kits at scale. Piggyback where possible on existing partner distribution channels of other medications and supplies to pharmacies and networks of clinics. Train: Train clinic staff to understand the content and use of the starter kit and how to engage with patients. Make Extra: Consider selling elements of the Starter Kits, such as pill carrying cases and bags, over the counter at higher margins to help subsidize production and distribution. This could also help with avoiding the designs becoming stigmatized over time, and reinforce their perceived value. If you can’t produce custom bags, look online for makeup bags you can buy in a variety of the brand colors (like black and pink), both plain and in fun patterns. Make sure they have a zipper, are opaque, and are at least 16cm by 18cm so they fit the pill bottle. You can order custom pill bottle stickers online from vendors like https://www.sheetlabels.com/--just submit the artwork we’ve already made! Print the FAQ insert yourself, and put it in the bags with the bottle stickers. Distribute the kits yourself to clinics and pharmacies. This website was made possible by the support of the American people through the United States Agency for International Development (USAID) under the U.S. President's Emergency Plan for AIDS Relief (PEPFAR). The contents in this website are the sole responsibility of the authors, and do not necessarily reflect the views of USAID, PEPFAR or the United States Government. Email launchingv@usaid.gov for more information.